Twenty-five years ago, Valerie Rudman and Lily Stone swore they'd be best friend s forever. They traded letters, swapped recipes, ranted about their parents, dissected first kisses, shared everything, and vowed to let nothing come between them. Now, two and half decades later, the thought of contacting Lily makes Val sweat. She wants to reconnect, especially when she sees an obituary for Lily's father, the enigmatic Dr. Stone, in the newspaper, but the last thing she wants is to reopen the wound that drove the friends apart in the first place. Has Lily matured enough to accept her renewed effort at friendship? Has Val? Will their shared past bond them together again? Or has it formed a chasm that can never be crossed? The Recipe Club by Andrea Israel and Nancy Garfinkel is an epistolary novel that uses emails, letters, recipes and other scrapbook-y bits to tell the story of a friendship. It begins with two very different girls, one studious, one showy. It grows as the two mature, one slowly, one swiftly. It solidifies as they pull each other through the murk of adolesence, cracks when their paths diverge, and disintegrates completely when their families' secrets entwine in a devastating way. Years later, as Val and Lily reach out to one another once again, they'll discover that the secrets their parents leaked are nothing compared to those they kept and the truth that wrecked the women's friendship might be the very thing that glues it back together. Although I didn't love, love, love this feel-good novel, I liked it a lot more than I expected to. Its format makes it a fast read, while the inclusion of recipes gives it a light-hearted tone that provides a nice counterpoint to the more serious plot twists. The story lacks a certain freshness, although it does take a few turns that surprised me. I was disappointed that, despite the book's intimate format, the characters never really come into their own voices. I kept having to look at the signatures to remind myself who was who. The ending also made me want to hurl with its cheesiness, even though I have to admit that it felt right somehow. That, coupled with some big plot holes, kept me from really devouring the book. Still, I found it to be a quick, enjoyable story that's surprisingly affecting. 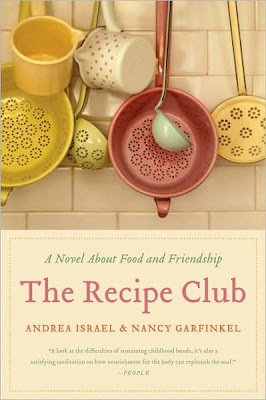 To the FTC, with love: I received a finished copy of The Recipe Club from the generous folks at TLC Book Tours, which is facilitating the authors' book tour. My review was written as part of the tour, but reflects my own, (very) honest opinions. You can visit the other tour stops by clicking here. I have this to read in my tbr pile. I like books about friends and cooking so I thought it would be an enjoyable read. I like the cover on your copy better than the egg that is on the cover of my copy.